An imaginative rendition of dolphins encircle this "light vessel" created for a couple who love the sea creatures. 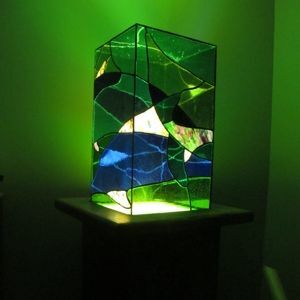 It is a focal point in their living room and sometimes serves as a luxury night light. Mouth-blown glass in blues and greens contrasts in color and texture with hand-poured "confetti" opalescent glass in pink and green hues. 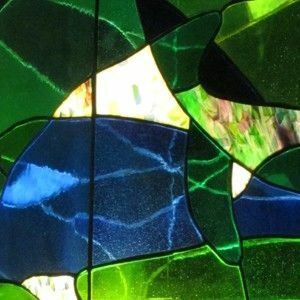 The 12" x 12" x 20" stained glass vessel was fabricated using the copper foil technique. It sits on an oak base with a recessed flood lamp.